Today my bedroom makeover continues with the walls. If you remember, yesterday I showed you how I transformed my bed into an inviting nest. My room “before” was just a place to lay your head and wasn’t inviting in the least. To me, it felt outdated, run down and mismatched. To begin the makeover, Kaytlin and I gave the walls a good coat of chocolate brown paint to match the brown in the bedding. The walls were easy to make over, but I was worried about what I was going to put on the walls. 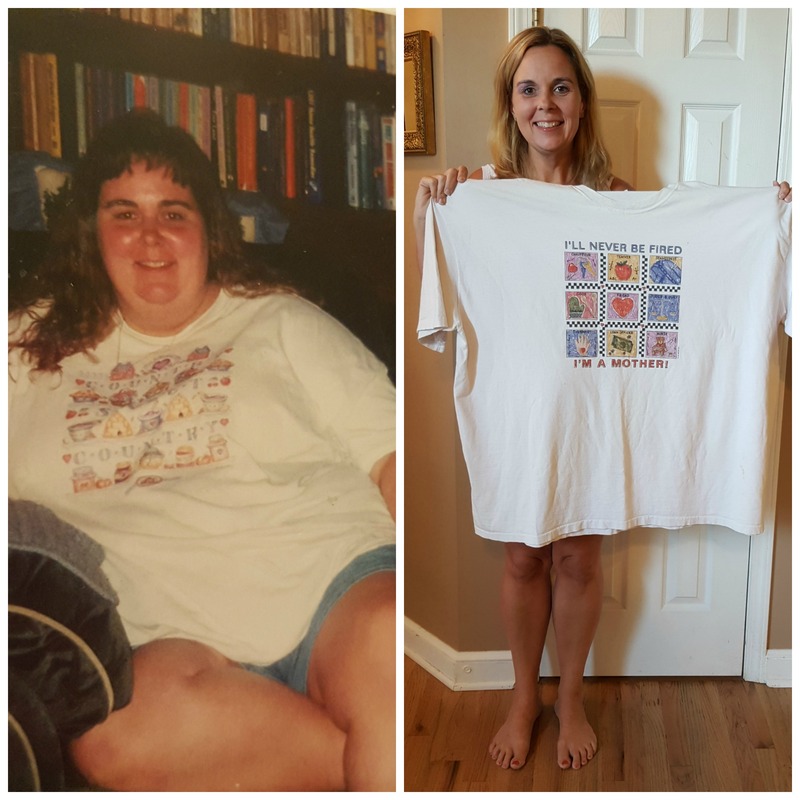 Obviously the floral print in my “before” picture wouldn’t go with the new look. The space above my bed is rather large and finding a print to fill the space would probably break the bank. 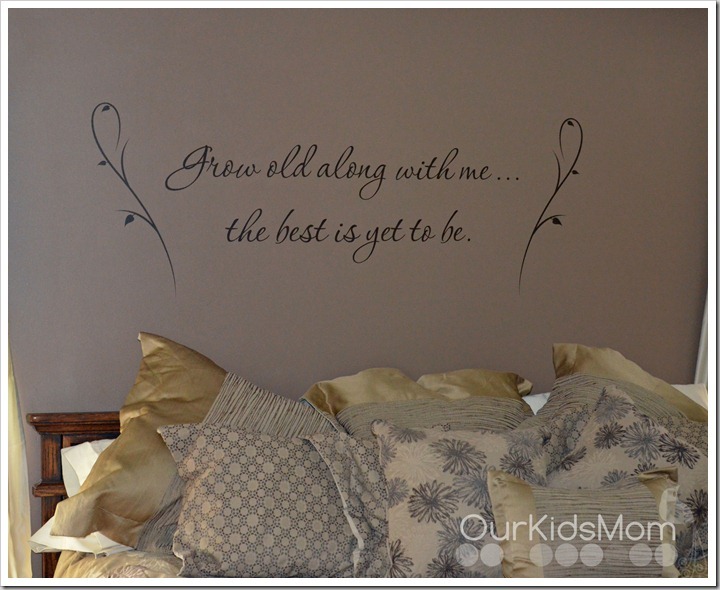 After some searching we found The Simple Stencil, a custom vinyl wall transfer site. I had never done a wall transfer, but I was willing to give it a go to get the look I was dreaming of. I found a saying that I loved in the premade section, but the font wasn’t exactly what I was looking for. After a little more shopping I decided that I would give the “design your own” section a try. The program was straight forward and rather easy to use and I had my design finished in a matter of a few minutes. After a little more shopping I found an embellishment that I thought would look nice with it and put two mirror imaged copies into my cart. I placed my order and anxiously watched the door each day for it’s arrival. Thankfully my order arrived quickly and was packaged well. I was happy to see that they included a few sample items for me to practice with because my actual product turned out rather large and I was a bit apprehensive to jump right into this project. After a little practice I decided it was time to for me to tackle the real thing. To be honest, I usually hang things on the wall by site alone. This bugs my husband to no end because he likes things to be hung “right”. I was doing this as a surprise while he was out of town, so I decided that I needed to do this right. My tools of choice were the tape measure and the level. It took a good amount of time finding the center of the wall and choosing the right height so that it would not be too close to my headboard, but I was pleased with the outcome. I got the phrase centered, level and then taped it up. Following the directions I pulled the paper off slowly and used the applicator (a fabulous tool btw) to press the words to the wall. I took my time when removing the top portion of the transfer, but somehow the periods didn’t transfer to the wall and stuck to my paper. That really wasn’t a huge issue though… I just repositioned it back on the wall and repeated the process and they adhered fine the second time around. My biggest challenge with this pattern was the embellishments. At first I was leveling the tops of the papers they were on so that they would be at the same height. I taped them on the wall and took a step back to check the position, it was then that I realized that the transfers weren’t positioned on the paper the same. I then repositioned and leveled to the tops of the embellishments, as well as measured from the distance from the words so they would be about the same distance on each side.Then it was time to apply the transfers to the wall. As you can see, I finally got it all in the right place and it turned out spectacular. I am beyond pleased with the quality, the look and the ease of application. My main wish with the whole process would be a “design your own” program that would allow multiple fonts and to add embellishments. If my entire design had been on one sheet instead of three I think the time to install it would have been cut in half. Overall, though… I would recommend The Simple Stencil for your wall transfer needs! 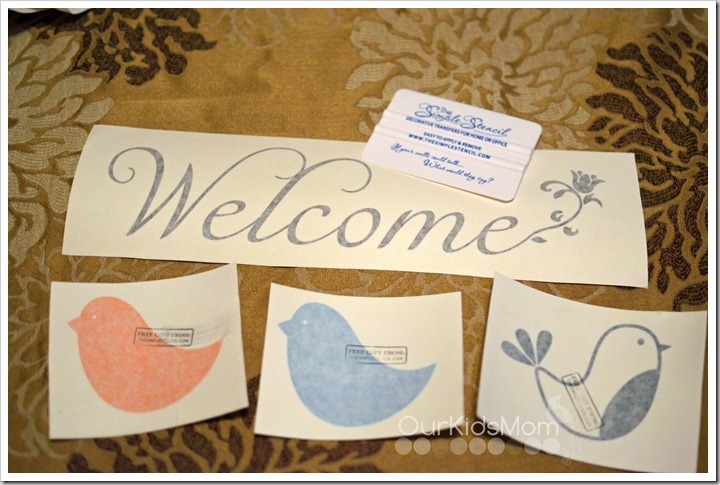 ONE OurKidsMom reader is going to win a $50 gc to The Simple Stencil! I like This is the day that the Lord has made. Let us rejoice & be glad in it. ~Psalm 118:24 stencil. I would love theFamily Tree. 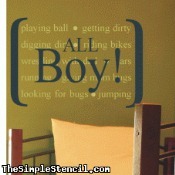 I like the ALL BOY! wall art. I really like the Celebrate…faith, family, friends stencil! The Family Tree would be awesome! I love this one: May this home be blessed with the laughter of children…etc. I like the Flower garden theme pack. I like the Twinkle…do you know how loved you are? decal in Golden Yellow. I like You are loved to the moon and back! I love the custom monograms!! I found a cute flower growth chart stencil. so many cute designs. Twinkle Twinkle Little Star and Goodnight are adorable! 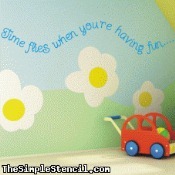 I like this decal: http://www.thesimplestencil.com/customize_your_vinyl_wall_design/401/family_home_blessings.html. I’d love to get one of the monograms. I learned that these are removable and reusable. I really want the family tree for my new living room! i like the Thank Heaven For Little Girls! I like their Owl on Branch decal and their monogram decals. I think I would have a hard time narrowing it down. I love the Imagine and Play. I like the May the lord bless you Numbers 6:24 with moon and stars stencil. I love the Spritual Scripture Wall Stencils they have. Thanks for the giveaway! I want the You Are My Sunshine stencil! I complain about my tiny little house and my old crappy car, but I am so rich with family, I need to be reminded of this. I love this saying! 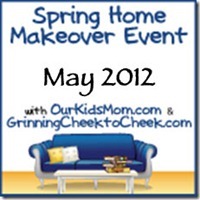 I’d love to get the Happiness is Homemade Quote or the Home Family Blessing Quote for my family room! There are so many I like! 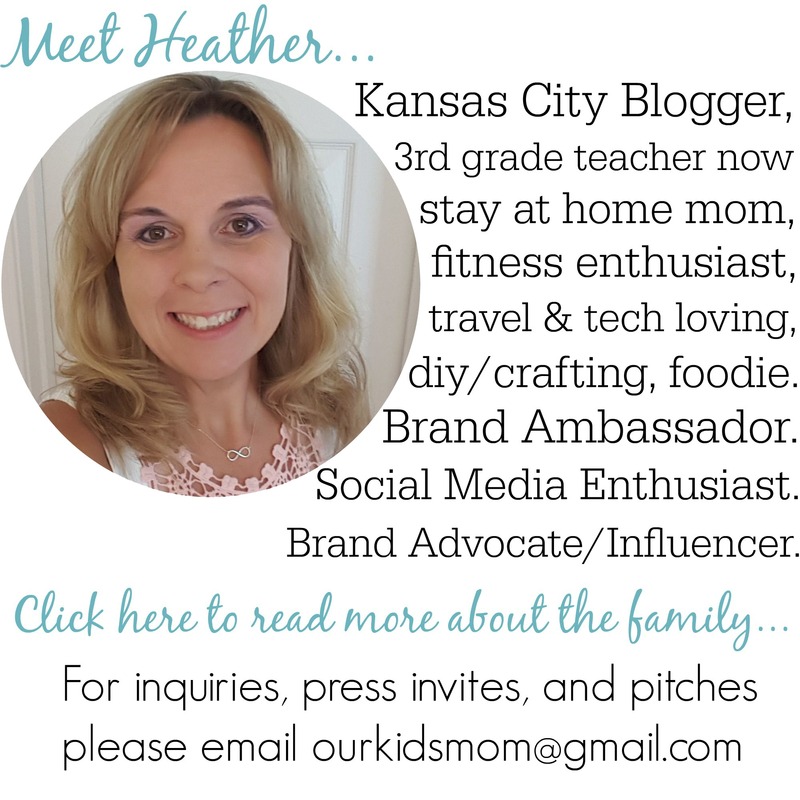 I love the Play – that would be perfect in dd’s playroom because it is always a mess! I also like the Dr. Seuss quote because it reminds me of my ds who we are not on speaking terms with right now – it was the 1st tattoo he got! I remember being so pissed – not because he got it but because he was told to wait until he was 18 when he could get it done in a tattoo shop that was clean and sanitary – not a friend’s house! He had less than than a year left. @@ Teenagers! I like that you can design your own. I absolutely love the Bible Scriptures. I also like that the removable wall decals are simple to apply & look professionally painted on. 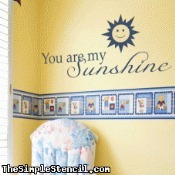 I want the “You are my Sunshine” stencil along with a sun to put in my nursery! I’d like the “Every good and perfect gift comes from above – James 1:17” with stars!!!!! I love that you can design your own stencil for you wall. i would love so many of these for our playroom- the play definition, read to me quote, princess crown, etc. My favorite is Family One of Gods Masterpieces. I hadn’t ever heard of this site before, but I love the idea of having a Bible verse gracing the entrance to my home. 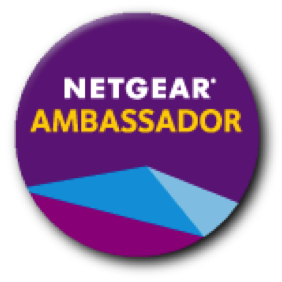 I learned that the company is located in Melrose, Florida. i love the over the moon and back, and you are my sunshine for the nurseries! love them! I love the peace dove embellishment! I REALLY want the “We are all a box of crayons” quote for the playroom! I have two 4 year olds, two 3 year olds, and a 2 year old. SO different so that would just be perfect for our lil house!!! I like the monogram ones! I like that you can Design your own stencils at Simple Stencil. Would really like to use this when we repaint our home! I like the “A PRINCESS SLEEPS HERE” perfect for my little Grand daughter. I like the swan ornamental wall decal. I like the Owl Always Love You	decal. I love that it is totally customizible!!! Beautiful spiritual verses…. I like the Blessed Are the Peacemakers verse. I could picture that over our front door, in the living room. I like the Love is a canvas furnished by Nature decal. I like the Stick Figures Value Pack. I’d like the you are my sunshine vinyl. I like the polly parrot decal. I like the Chinese characters. 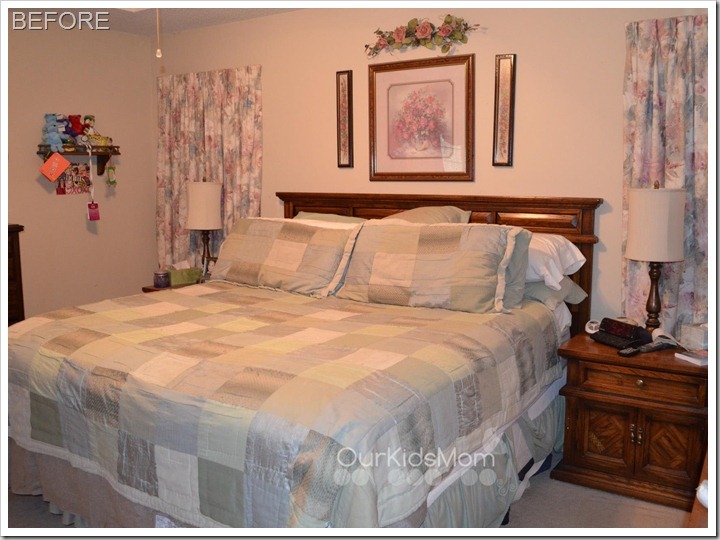 I love so many things, but I do really like the Master Bedroom Collection and I love that many are fully customizable. They have spiritual verse stensils! i liked the a princess sleeps here stencil. I love the idea of getting a Monogram vinyl transfer. What a cool idea!! I love the Ghandi quote. 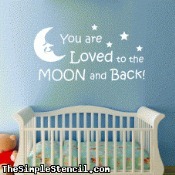 You are Loved to the moon and back for baby nursery. i love the flourishes, two hearts & scroll bracket! My favorite stencil is Peace. Love and Joy to all who enter here! I like you can design your own wall.